Photo courtesy of The Bushnell. They're creepy and their kooky, mysterious and spooky. They are The Addams family, icons of 1960s pop culture based on characters created by cartoonist Charles Addams. In this made-for-stage version, daughter Wednesday (Courtney Wolfson, who understudied the role on Broadway) has fallen in love. All she wants is for her family to act normal for one night to meet her intended, Lucas Beineke (Brian Justin Crum) and his parents, Mal and Alice (Martin Vidnovic and Crista Moore). Normal isn't the norm in the Addams family manse, oddly set here in the middle of Central Park. Parents Morticia (Sara Gettelfinger) and Gomez (Douglas Sills) make love while fencing and delighting in various tortures, Uncle Fester (Blake Hammond) lights bulbs in his mouth and is in love with the moon, Grandma (Pippa Peartree) collects odd herbs and potions to cast spells and Wednesday's brother, Pugsley (Patrick D. Kennedy) enjoys blowing things up and being tortured. Oh, and there are all those ghosts of the family's ancestors (the ensemble) floating around trying to help the romance along. Alice and Mal, however, are "normal" being from Ohio, Dinner at the Addams, including their weird, moaning butler, Lurch (Tom Corber), who looks like Frankenstein, isn't exactly normal in their world and trouble ensues. It's always a pleasure to see Sills (The Scarlet Pimpernel) and hear his lovely voice. He puts his own brand on Gomez -- no easy task when following in the steps of John Astin and Nathan Lane. Well done. Hammond is a hoot as the zany Fester. Puppetry by Basil Twist (drastically scaled down for the tour) is fun and the lighting design, sets and special effects (Natasha Katz, Crouch and McDermott and Gregory Meeh, design) are very well done. The ensemble is fine and all of the vocals are strong. Saturday at 2 and 8 pm and Sunday at 1 and 6:30 pm. 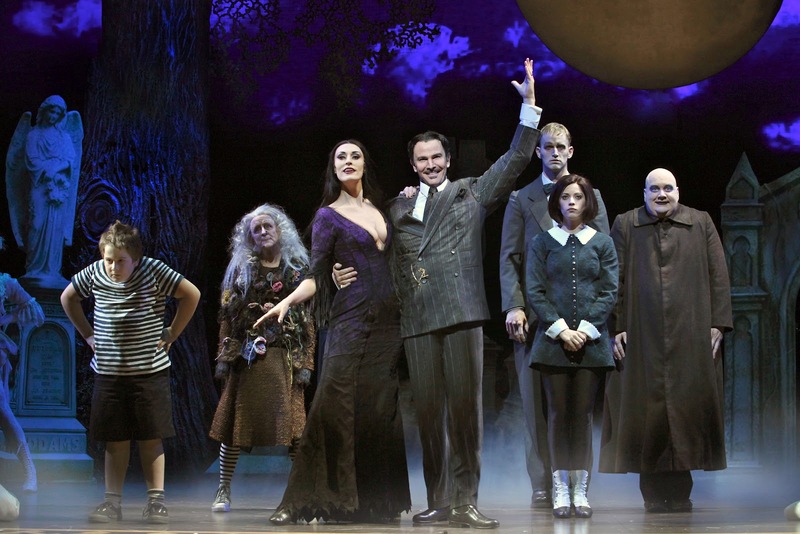 For more information, visit www.theaddamsfamilymusicaltour.com.